I arrived this morning at seven o’clock safe and sound, and this time, to my disappointment, the train was on time. I could have used another’s hour’s sleep to advantage. Sweetheart, I certainly did hate to leave you last night—and the way I miss you to-day is something terrible. I am quite sure that I love you much more than you realize. It did me so much good to be with you yesterday, dearest, and I thank you with all my heart for it. I am more certain than ever that you are by all odds the one very finest girl in all the World. Here is a piece of luck for me. The President and Mrs. Wilson, (are you accustomed to using Mrs. Wilson yet?) I am not, They are leaving here Wednesday for New York—expecting to arrive in the early evening, or, afternoon and remain over until Friday. I am so happy over the prospect of seeing you two nights; but that will seem very brief—for time flies so rapidly when I am with you, dear, as soon the plans for the New Yorktrip are definitely settled, I shall let you know immediately all about them. 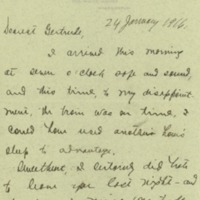 The outlook from my standpoint, is better than I pictured to you yesterday—for I was under the impression the President would be there for one afternoon and leave that night at 12.30—I am waiting to see Miss Bones—hence this White House stationery—She and Miss Edith are out to a concert, so I decided to write here and not wait until I got home. As a matter of fact I am not staying here until sheher return—for I have to visit Mr. Pence at the Emergency Hospital and Mrs. Tumulty at the Columbia Hospital before dinner and it is now 5.30. I had a little chat with Miss Edith this morning. She was most anxious to have some news from you. I told her about my loss of memory and how badly I had treated your birthday—and I how mean I felt about it. She loves you truly. I, also, told Miss Helen the same story. Miss Edith is anxious to see you—and I think you both are going to greatly enjoy being together in New York. To-day, the former Secretary of the Navy, Mr. Meyer, sent for me—I found that he and Mr. Truxton Beal had had a fist fight in front of the Metropolitan Club—Mr. Meyer wanted my professional assistance which I gladly rendered. He received a bad scratch in the eye and a bruise on the face. I understand the other fighter was more bruised—but I did not see him. They are both being tried by a committee from the Metropolitan Club this afternoon, as the row started in the club—I had a visit from Monroe this morning. He is still minus a job—I am to see him again Wednesday. Also, I had a call from Dr. Derby, Ethel Roosevelt’s husband, said Mrs. Derby had expected a call from me while I was in New York. I was cornerd, but made my best effort to explain. Grayson, Cary T. (Cary Travers), 1878-1938, “Cary T. Grayson to Alice Gertrude Gordon Grayson,” 1916 January 24, WWP20940, Cary T. Grayson Papers, Woodrow Wilson Presidential Library & Museum, Staunton, Virginia.